Micromax A45-new Dual SIM Android smart phone from Micromax also called ‘Punk’. Specially concentrate to awesome music experience with HD surround sound of its crystal clear head phones. 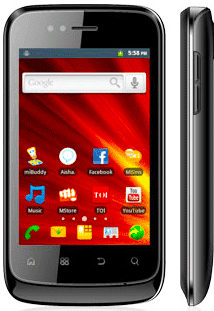 Micromax A45 Punk runs on Android 2.3.6 (Gingerbread) with Rich multimedia technology, powered by a powerful 650 Mhz processor. It is better for gaming experience and multitasking. Micromax A45 has 3.5 inches multi touch capacitive touchscreen with 65K vivid colour display and a 1300 mAh Li-ion battery, capable a talk time of 4.5 hours. With the A45 Punk Micromax introduces AISHA (Artificial intelligence Speech Handset Assistant), a SIRI-like voice recognition software. Micromax A45 also comes with a 2 MP camera and memory expandable up to 32GB. Micromax A45 Punk is available in two colours - white and black. Display Screen: Capacitive touch Screen with 320 X 480 pixels.